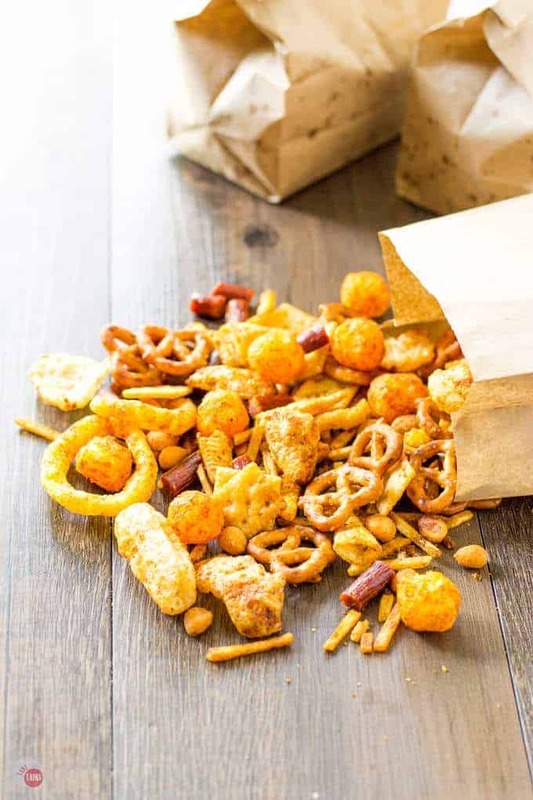 Redneck Snack Mix Party Mix For Tailgating or Any Occasion! 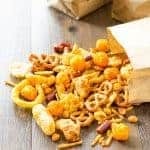 Home » Redneck Snack Mix for Parties or Tailgating! I am on some kind of snack mix craze lately. If you missed my Asian Wasabi Chex Mix you certainly missed out. It is a spicy blend of wasabi, soy and rice crackers along with other Asian inspired goodies. I like doing themed snack and party mixes because then you can get the perfect one for your family. Seeing that I am moving from Waycross this week, I thought it only fitting that I make a Redneck Snack Mix in honor of my home for the last 11 years. Summer is here and everyone is grilling and using their BBQ. Some people use BBQ as a noun and some use it as a verb. Is it BBQ chicken, BBQed chicken, or chicken on the BBQ? It is all very confusing to me. When I think of BBQ, I think of charcoal, smoke, outdoors, and char on my burgers, dogs, and chicken. My Pa was the king of the BBQ (the charcoal grill)! I made my Homemade BBQ Seasoning Mix in honor of his amazing skills and the flavors he always coaxed from those coals. Just take me to the Redneck Snack Mix Recipe Already! 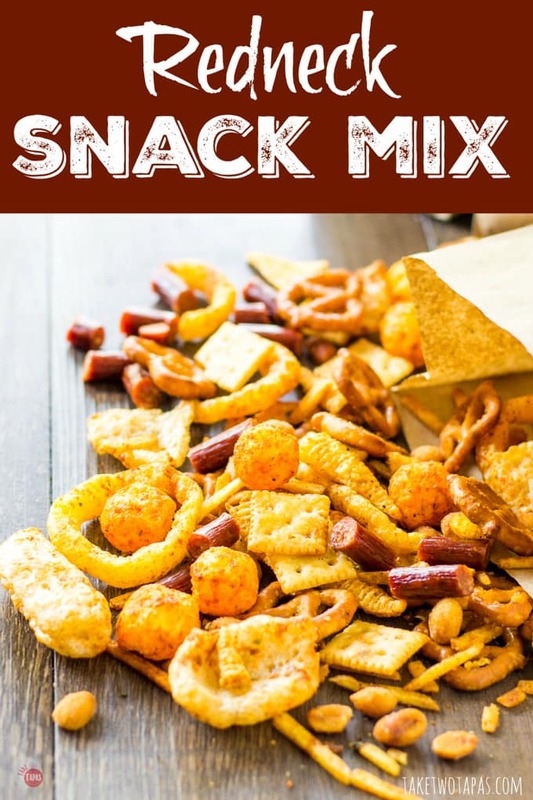 If you’d rather skip my (very helpful, I think) tips and tricks, essential cooking info, and similar recipe ideas – and get straight to this delicious easy Redneck Snack Mix recipe – simply scroll to the bottom of the page where you can find the printable recipe card. Back to my tiny town. It is pretty rural so there are a lot of “rednecks” here. Not that it is a bad thing, it means that you are hardworking and usually work outside so you get that weird tan line! Some of those guys eat some crazy snacks while they are working during the day. These include pork rinds, cheese balls, pretzels, Saltine crackers, and Funyuns. Have you ever had a Funyun? A Funyun is like an onion ring only it is really a fried corn chip ring that just has onion flavor. Like a poor man’s onion ring. I ate them a few times as a kid but shied away from them when I got to “kissing” age. Another goodie is the Bugle. Bugles are also a “corn chip” if you will, just shaped like a cone. To me, I can take or leave them unless they are the spicy flavored ones. Those I love to snack on! How about Potato Stix? Like shredded, thick potato chips they are a crunchy must. The shape is really the thing that throws me off the most. But they are sold by the massive can load so they must be someone’s favorite. To round out this mix, I add some honey-roasted peanuts and a few Slim Jim or beef jerky sticks which are always a classic snack item. These are the types of snacks you see people grabbing at the convenience store while pumping gas and getting their 809-ounce fountain soda in the styrofoam cup. I love these snacks and grabbing them while on a road trip or after a long night of studying in college. They are inexpensive and fun to eat. Let’s get to that part now! I combine all these tasty items into one tasty “redneck” snack mix and add another layer of flavor. I know some of these items have a strong flavor all their own. Hello, Funyuns and cheese balls! But adding a spice mix to all the ingredients ties them together and makes the redneck snack mix feel like a complete party mix. What better spice mix than my Homemade BBQ Seasoning? These ingredients contain a lot of similar flavors and spices which help to bring them all together. Just like making my Sriracha Snack Mix, you start by combining all your redneck snack mix items. I found that if you can’t find the mini saltine crackers or any of the other items, you can substitute good old corn chips or Fritos, and some plain potato chips. It is a very versatile snack mix. Much like a redneck him (or her) self. Once all the redneck snack mix items (minus the peanuts and jerky) are combined, pour on your seasoning mix. This is a simple mixture of butter, Worcestershire sauce, and my BBQ seasoning. Feel free to add your own dry rub, spice blend, or mixture. Just make sure that it is dry. Toss to combine and coat the snack mix as evenly as you can, and then spread out on a baking sheet. Place in an oven at 250F and bake for one hour. Stir every 15 minutes to ensure they are toasting evenly. This is the reason I leave out the honey roasted peanuts. My first attempt at this mix (at 300F and with peanuts) left me a charred and burnt mess. The brown sugar in the BBQ seasoning combined with the honey roasted peanuts does not go well with high heat. Once the Redneck Snack Mix has cooked for the hour, remove from the oven and let cool. Add the honey roasted peanuts and the jerky (cut into tiny pieces) and mix again. Store in an air-tight container, or plain brown paper bags like me, for up to 5 days. Mine didn’t last this long. When I delivered to my friends, they gobbled it up. Funny thing is that each person picked out their favorite individual snack item and ate that first. That works out great because another person came behind them and ate another item. Don’t get stuck being the last one in the redneck snack mix or you will end up missing out on all the ingredients! Q: How long will this Redneck Snack Mix last after I make it? A: It will last up to a week if stored in an air-tight container. If you are storing for more than 3 days, I would leave the beef sticks out and add them at the last minute. The beef sticks will add moisture to the mix that will make it stale faster. Q: What if I can’t find one of the ingredients? A: This is a Redneck snack mix for a reason! Use what you have in your pantry or what you can find! Just make up the volume with another ingredient. 14 cups of dry snack ingredients are what you need. Q: What if I can’t find the mini Saltine crackers? A: You can use regular-sized saltines and break them into smaller pieces if you can’t find the mini ones. Looking for a snack mix to take to a party you’ve been invited to? How about a quick appetizer you can make ahead of time for a get-together that you are hosting and are already stressed to the max? 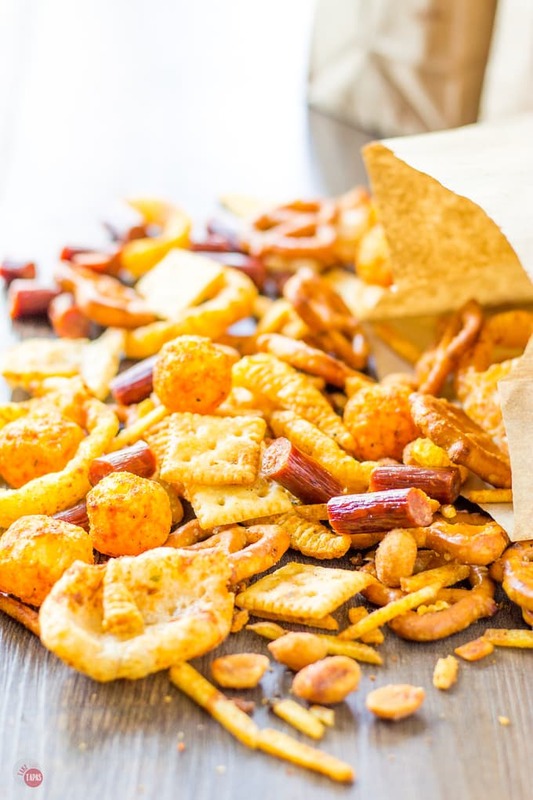 Check out these snack mixes, both sweet and savory, to fit your special occasion! If you love this Redneck Snack Mix Recipe as much as I do, please write a five-star review in the comment section below (or on Pinterest with the “tried it” button – you can now add pictures into reviews, too! ), and be sure to help me share on facebook! 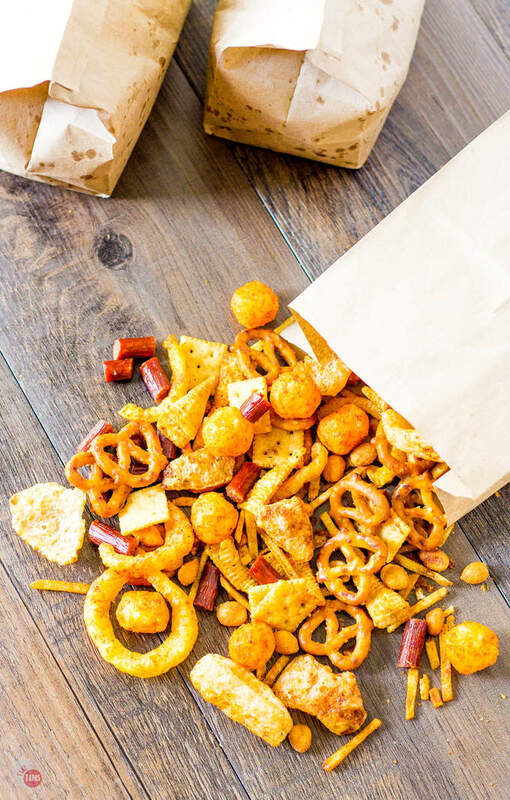 This simple, humble, and tasty Redneck Snack Mix will be a favorite on your next road trip! 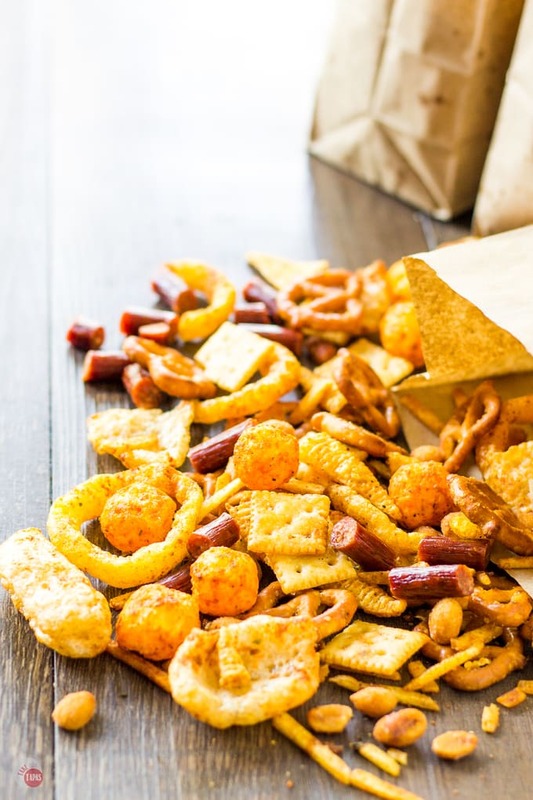 All your favorite snacks like pork rinds, saltine crackers, cheese balls, and pretzels all mixed into one Redneck Snack Mix with BBQ Seasoning. Combine all the snacks (minus the peanuts and jerky) together in one bowl. Stir the Worcestershire sauce into the melted butter. Stir in the BBQ Seasoning until combined. Pour the butter, Worcestershire, and BBQ seasoning mix over the snack mix. Stir or toss to coat the snack mix evenly. Pour out onto a baking sheet and spread into one layer. When the hour is up, remove from oven. Add in the honey roasted peanuts and jerky. Serve with friends or store in an air-tight container for up to 1 week. I am always looking for new snack mix combinations or themes and my favorite blogger that makes snack mixes is Keri from Shaken Together Life. We are kindred spirits when it comes to having two boys that eat you out of house and home. Her Poolside Puff Munch Mix is a hit at our house and uses great snack items like popcorn, pretzels, and goldfish crackers. My kind of snacking. She also has a great line of cookie mixes for the holidays! 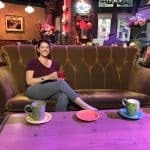 Check her out! LOL oh my god this looks amazing. I want to try this. I never thought of putting slim jims in the mix. Amazing idea. Excellent recipe, I will def try this.